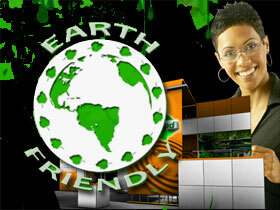 ExpoDisplays is committed to eco-friendly exhibits including finding ways to keep used exhibits out of landfills. With our eco-friendly MultiQuad, we provide you with a great exhibit that is built to last for many years. However, should you no longer need it, we will pay you to recycle with our Redeem For Green recycling program. 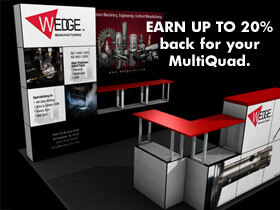 Redeem for Green is easy to sign up for and free when you purchase a MultiQuad Exhibit System. And if you no longer need your MultiQuad, instead of paying to send it to the landfill, you SELL the frames back to ExpoDisplays for up to 20‰ of the current MSRP…cash! Now that is a good way to be Green and get some Green for your efforts! 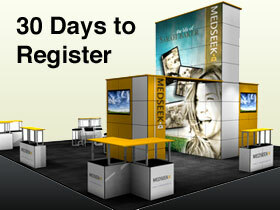 You must register your product within 30 days of purchase to qualify. Simply complete the form on RedeemForGreen.net and your information will be stored in our database of registered owners. You will receive an e-mail confirmation to confirm program eligibility. Why is Redeem for Green Offered? ExpoDisplays is committed to eco-friendly exhibits including finding ways to keep used exhibits out of landfills. With aluminum as the primary component, MultiQuad is already an eco-friendly product. But it is also sturdy, reliable and built to last for many years. We would rather see structurally sound and functional MultiQuad components reused instead of thrown away. It just doesn't make sense to throw away a perfectly usable product. 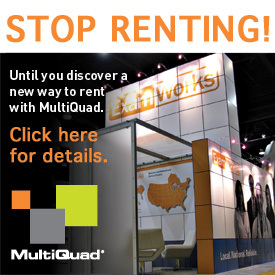 ExpoDisplays will take back MultiQuad exhibit systems that are no longer needed. Items that can be reused will be purchased back and resold or rented to someone else. Items that cannot be reused will be recycled if possible. And items that fall into neither category must unfortunately be discarded at ExpoDisplays’ expense. ExpoDisplays will repurchase select MultiQuad components from original owners who registered the product with ExpoDisplays. This free registration must be completed within 30 days of receipt of the product in order to qualify for Redeem for Green. MultiQuad items will fall in one of three cash redemption levels: 20%, 10% and 0% (Recycle). 20%: Complete and functional MultiQuad frames including tower, counter and podium frames. 10%: Standard counter tops depending upon condition and color. Standard Quads depending upon condition and color. Standard Accessories depending upon condition, color, and current model relevance. Cases (SC50) if in good working condition and relevant to current MultiQuad products. Lights if functional and if that model is still utilized as an option on MultiQuad. 0%: Non-standard, unique or customized MultiQuad items. Review full specifics of the redemption values.